Alabama Teaches America a Lesson All of us need to sober up, think about the long term, and be aware of the impression we’re making. This is a dead-serious time, and we keep forgetting it because the times have been serious so long. There is inspiration in the Alabama outcome. To see it in terms of the parties or Steve Bannon is to see it small. The headline to me: American political standards made a comeback. Roy Moore’s loss was not a setback for the GOP; it was a setback for freakishness. It was an assertion of prudential judgment by the electorate, and came as a relief. A friend landed at JFK on an international flight on election night. 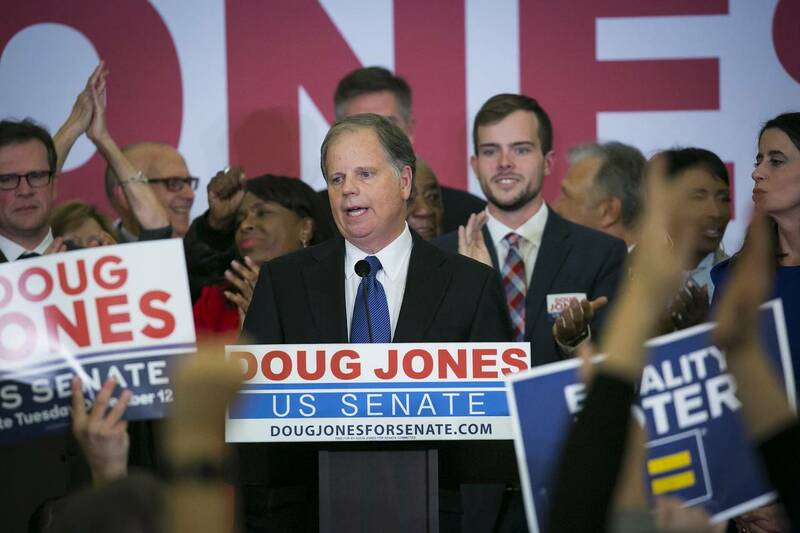 As the plane taxied to the gate, the pilot came on the PA and announced that Doug Jones was in the lead. The entire plane, back to front, burst into applause. “A big broad nerve was hit in this thing,” said the friend, an American and political conservative. He meant not only here but around the world. And now they’ve lost it all. Voters in coming primaries should observe and absorb. There is something we have been saying in this space for almost a decade, since the Sarah Palin experience. Something happened when she ran. Suddenly to seem real and authentic some Republican candidates thought they had to be polar and extreme. They had to show umbrage, signal resentment, wave guns. But these are not indications of authenticity. They are a sign voters are being played, probably by a grifter. When a candidate is equable and experienced it is not a sign of cynicism and not evidence that he is “establishment.” It’s a sign he can maybe do a good job—and win. Conservatives who are real conservatives don’t ape the social-justice left and make politics a daily freak show. They keep their cool, argue their case, build broad appeal and become, in this way, politically deadly. Which gets us as always to President Trump. The Alabama number that should scare him was in the exit polls. In 2016 Mr. Trump won the state with 62% of the vote, to Hillary Clinton’s 34%. Tuesday night the exits had him at 48% approve, 48% disapprove. And this within a national context of good economic news. Mr. Trump’s political malpractice has been to fail, since his election, to increase his popularity and thus his power. He has a core but it remains a core. He could have broadened his position with a personal air of stability and moderation, and with policies that were soft-populist. He has failed to do so, primarily due to his self-indulgence—his tendency to heat things up when he should cool them down; his tendency always to make the situation a little worse, not a little better. His tweets, his immaturity, his screwball resentments and self-pity alienate and offend. Trumpism led by a competent or talented Trump would have been powerful and pertinent to the moment. It would have reoriented the Republican Party in terms of understanding that its own base was increasingly populist, yet also ideologically moderate. That new understanding hasn’t developed. The great and fateful question now, the one to which we may well get an answer in 2018, is: Can this man lead through a crisis? That is the question that has to be on your mind when you think about North Korea. Can he be credible, persuasive; will Americans feel they can follow him? Will the West? No one looks forward to finding the answers to these questions. Donald Trump has been a great gift to the Democrats. Opposition to him is the one thing that keeps them united. But he won’t be there forever—they’ll try to see to that!—and when he’s gone, the squirrels will really begin to fly. Finally the FBI, the Justice Department and the special counsel look dinged right now. Those who support serious probes to answer big questions and thus support the Russia investigations, as I do, hope whatever findings come from the special counsel are and can be treated with respect. To earn it the investigators must appear every day to be clean as a hound’s tooth. Is that how it’s looking? Or are critics getting ammunition? Snotty, partisan text messages between FBI investigators, including one in which an agent said he could “smell” the Trump supporters at Walmart, expressed anti-Trump biases. Government employees have a right to political opinions, but the FBI, Justice Department and special counsel should be running a tighter ship. During the Clinton-Lewinsky wars, the left went after Independent Counsel Ken Starr, sliming him as surrounded by Republican operatives. It did him, and America, no good. We are a divided country. The special counsel’s findings could prove momentous. Everyone involved should sober up, think about the long term, and be aware of the impression they’re making.